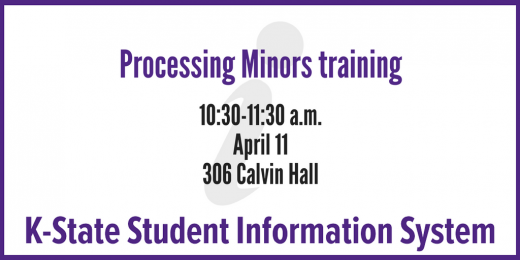 A “Processing Minors” training session is now available for K-State employees who approve minors for students who are graduating. The training session is 10:30-11:30 a.m. Tuesday, April 11, in 306 Calvin Hall. 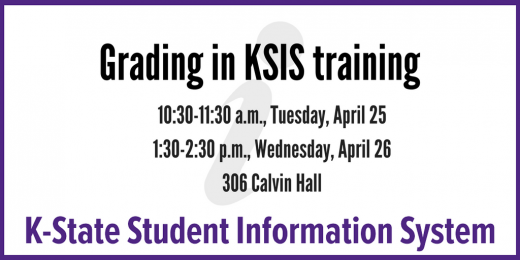 KSIS training dates and times are now available for spring 2017. Instructor-led training is available for faculty, academic advisors, and staff at no charge. However, registration through HRIS is required. See Using HRIS to register for classes. For more information about each topic and the dates and times for training, visit the KSIS Training web page. If you have any questions or need more information, please contact Fred Darkow, KSIS Training Coordinator, at fdarkow@ksu.edu or 785-532-3138. 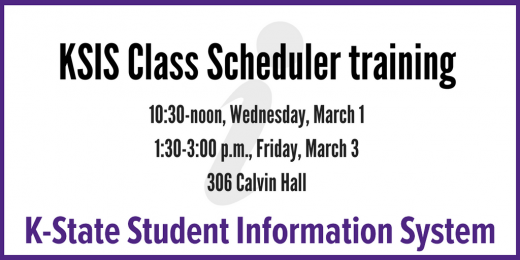 Due to popular demand, additional Grading in KSIS sessions have been added for faculty and staff wanting to transfer grades from both Canvas and K-State Online Classic to KSIS. The training is intended for faculty and staff members who are involved in submitting grades at the end of the Spring 2015 term. Tuesday, May 5, 1:30-2:30 p.m.
Wednesday, May 6, 9:30-10:30 a.m.
Grading in KSIS training is now available to faculty and staff. This training is intended for faculty and staff members who are involved in submitting grades at the end of the Spring 2015 term. Tuesday, April 28, 2:30-3:30 p.m.
Wednesday, April 29, 10:30-11:30 a.m.